On Monday my guild had a guest speaker, Nancy Trowbridge. 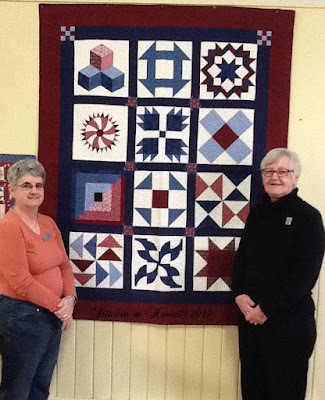 She is a judge with the CQA( Canadian Quilters' Assoication), she had a quilt store in Essex county. 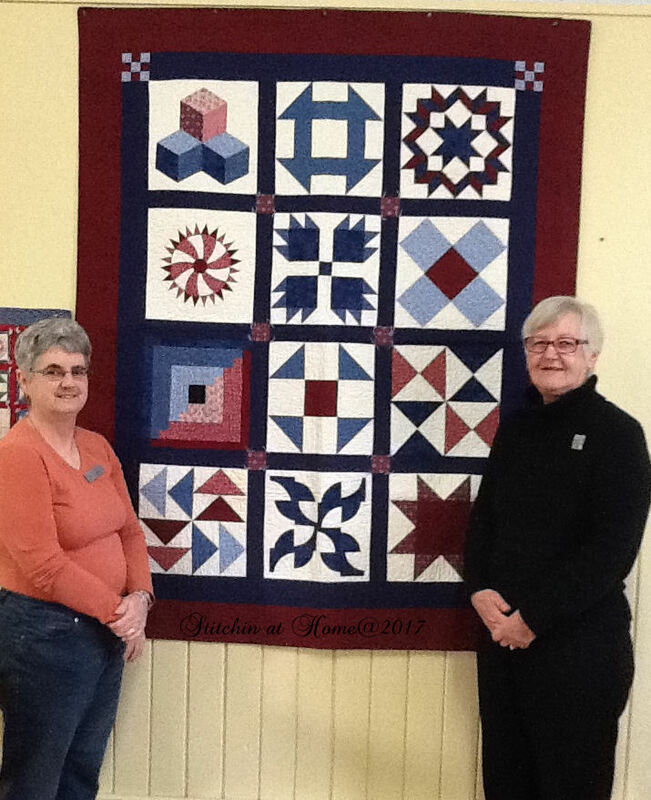 Nancy discussed the Underground Railway and how quilts and quilt blocks may have played a role in the slaves’ trek to freedom in Canada. What a wonderful speaker, she held everyone's attention throughout her talk. The quilt pictured above is one she made with the blocks and there significance to the slaves journey. I like history and this was all about history. She referred to a book written by Jacqueline Tobin called Hidden in Plain View. Sorry about the quality of the photos, someone may have forgotten their camera. 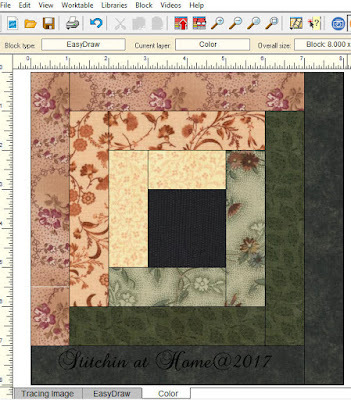 All this has gotten me to thinking more about the history of quilting. Julie of Pink Doxies is into the history of fabric and quilts, she and I have been discussing the subject of quilt history. One block is the log cabin block. In the British Isles, it is often called "Canadian Logwork".Did the block originate in Europe and travel to the new world 'Canada' and then the US? I am a second generation Canadian with European grandparents, neither of my grandmothers quilted that I know of. My paternal grandmother was from Finland she had a treadle sewing machine, that I used when at her house, but sadly no quilts. Julie sent me this link to read. How fascinating! There is also a good article on the Emporia State University site called the 'History of Quilting'. Do you like to the history of quilting? I found the book, "Hidden in Plain View" on alibris.com - http://www.alibris.com/Hidden-in-Plain-View-A-Secret-Story-of-Quilts-and-the-Underground-Railroad-Jacqueline-L-Tobin/book/2891170?matches=122. Discredited or not, it should be a fascinating read. 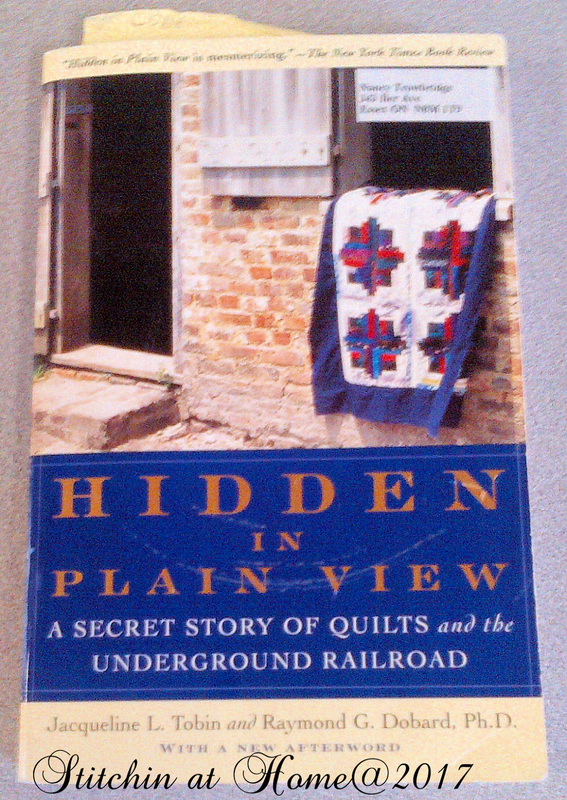 I own a copy of the book and have read it, first becoming aware of it when Jacqueline Tobin, the author, appeared on Alex Anderson's "Simply Quilts". It IS as Susan surmises, a fascinating read. I too wish there would be actual research done on this topic, as the authors state near the end of the article. Anything that acknowledges helping one's sister and brother humans deserves the spotlight IMHO. You and I had numerous discussion about this, Cindy. I think the biggest thing to take from all this discussion is, "It cannot be determined for sure at this time." Ask an historian about anything controversial, and they will be hard pressed to say everything we know about an event is the whole truth. A good example is the painting of Washington Crossing the Delaware River. It happened, but just not exactly like the painting shows. On the other hand, most of us can say from memory, "Washington crossed the Delaware with his men." It has served as a reminder today, and back during its creation to inspire bravery. It is notable that when it was created in the 1850's that it was done with great attention to be accurate as possible. History depends on perspective as much as anything, too. Two people who see the same event will tell it very differently. It's highly influenced by your view point and also emotion. Sometimes a story is told so many times it morphs into something else, and some stories are passed through generations of family, and seem wholly unbelievable, yet are true. My husband's grandfather saw Thomas Edison and Henry Ford together one time. I get the details mixed up as to where, but the essence is its still the truth. I live in an area of Ohio where there are several old homes that it's said sheltered slaves along the Underground Railroad. Surprisingly, we aren't on the typical trail that they were said to have traveled. Yet I've been in one of them, and there are false walls in the upstairs and a tunnel leading out of the basement. Was it true or not? There is nothing written to back it up, and no one is alive any longer to dispute or confirm it. Is it remarkable that Harriet Beecher Stowe lived in the southern most area of this state? I will say I agree that we should not create truth out of myth for the sake of saying it could be true, but when we also cannot say for sure it is not, I also hesitate. I think I'm going to have to side with Sandra when she says it is plausible. Plausible for sure. We know that Anna Strong hung her laundry out as a code during the Revolutionary War, so it was already a known way to pass messages. Just saying plausible folks.